Huawei brings its top specs to a new, smaller MediaPad — and the result is basically an 8.4-inch phone. Android tablets are in a weird place right now, with slow sales and relatively few compelling devices on the market. Huawei is one of the rising brands in Android phones right now, particularly in Europe, and thus the company has cash to plow into making high-end tablets where others might shy away. The Huawei MediaPad M3 is the latest creation of the Chinese firm, with significantly upgraded specs from the previous-gen M2 — let's just forget about that thing, okay? — as well as refreshed software and refined build quality. Huawei's latest fits neatly into its portfolio between devices like the MateBook and P9 series, with an 8.4-inch display size that hits the same sweet spot as the iPad mini. But can a company still struggling to find its way in smartphone software step up and create a worthy Android tablet experience? Read on to find out. About this review: Ahead of its announcement at IFA 2016, we used the Huawei MediaPad M3 for a week in Manchester, UK and Berlin, Germany. Our model was LTE-equipped — using an EE SIM card — and running pre-release B005 firmware. 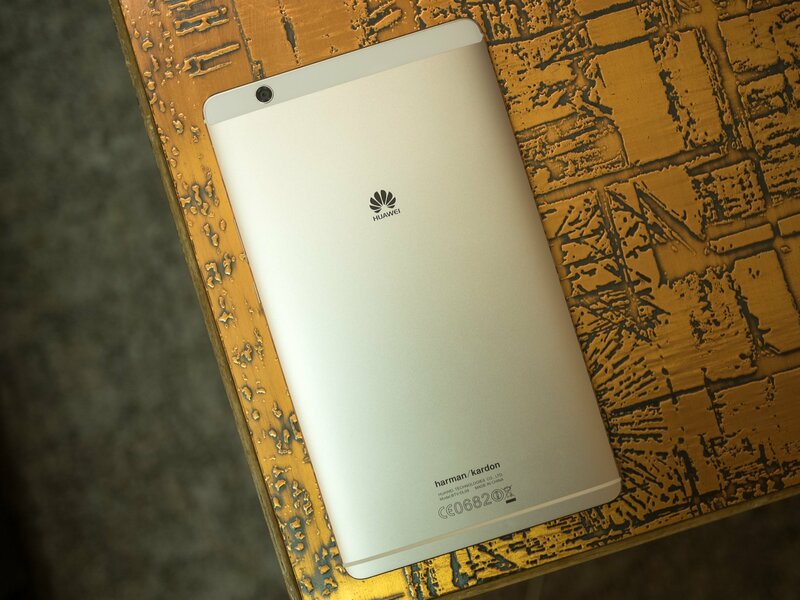 From the outside, the Huawei MediaPad M3 mirrors the design of the company's latest mid-level phone, the Nova. There's a big Nexus 6P-style camera visor up top housing the 8-megapixel rear shooter. Aside from that, and a bit of branding, it's a largely featureless slab of metal, broken up by reflective chamfers that also ease one-handed use a little. Huawei's tablet build quality finally matches that of its high-end phones. A large part of that heft has to do with the immense battery lurking within — a 5100 mAh cell that we've found able to drive up to a week of moderate-to-light use on Wi-Fi. (Helped along by Android 6.0's Doze functionality, no doubt.) As for video playback (streaming, also over Wi-Fi), the tablet sips power, and after a couple of hours of YouTube binging we'd yet to deplete the tablet to below 80 percent. On a cellular connection you can expect a predictable dip in longevity. Elsewhere, the MediaPad M3 packs in all the latest Huawei internals — the Kirin 950 chip powering the Mate 8 and Honor 8, backed up by 4GB of RAM and 32 or 64GB of storage, along with microSD expansion. And as this is a MediaPad, audio and video have received special attention too. The display is an impressive 2560x1440 IPS LCD panel, which boasts vibrant colors and ample daylight visibility — though with just a tiny bit of noticeable light bleeding in the white model we're reviewing. On the audio side, Huawei has partnered once again with Harman/Kardon to bring an impressive pair of stereo speakers to the MediaPad M3. Alongside a dedicated DSP capable of handling 192kHz, 24-bit content, the bundled software can tweak output depending on the type of content you're listening to. Generally, audio playback is similar to that of the MediaPad M2 10: extremely loud (almost uncomfortably so) at the highest volume level, but lacking some of the bass and clarity you'd get from a standalone Bluetooth speaker system. The tablet inherits Huawei's excellent fingerprint scanner tech from its Android phones, with a front-mounted sensor for unlocking that also doubles as a mini trackpad of sorts for gesture shortcuts. (For example, swipe horizontally to launch the recent apps switcher, or tap to go back.) Despite its small size (compared to the average smartphone fingerprint sensor, at least) it performs well, and Huawei's fingerprint setup is relatively painless too. A largely forgettable rear camera. Unfortunately, despite the prominent camera band around the back of the device, the M3's rear shooter is largely forgettable. Low-light performance from the 8-megapixel unit is aggressively mediocre, with an abundance of chroma noise. And even daylight shots appear soft, without much fine detail. It's not surprising for an Android tablet camera to be an afterthought, it's still disappointing to see such a low-quality setup used in a relatively high-tier gadget. Performance across the board has been decent, with a few exceptions. The Kirin 950 chip is a proven performer, and manages browsing and light app usage with ease, as well streaming video at up to 2K resolution without a hitch. The only places we ran into performance issues were in demanding games like Asphalt 8, where the default graphical settings made the game almost unplayable. Less graphically intensive titles like Angry Birds 2 performed just fine. The major takeaway here: Browsing and media consumption are just fine, but don't expect the M3 to be a serious gaming tablet. The Kirin 950 simply doesn't have the graphical horsepower to drive high-end games at 2560x1600. On the software side, the MediaPad M3 mirrors what we've seen from the past generation of Huawei smartphones. It's running Android 6.0 Marshmallow out of the box, along with Huawei's EMUI 4.1 software layer. Like its M2 predecessor, the experience you're getting here is basically a phone UI on a larger display. Given the M3's 8.4-inch form factor, however, you can more or less get away with this. And this time around Huawei's also done a better job to ensure built-in apps like the dialer, messaging app and settings panel scale sensibly in landscape mode. That said, the experience remains basically just like using an enormous Huawei phone. All our favorite features from EMUI on phones — tight control over background apps for improved battery life, handy tethering features, display tweaks like "eye protection" mode and direct control over screen density — remain intact. As does Huawei's split-screen mode, which is useful enough on a larger display, despite only supporting a handful of apps. Unfortunately you'll need to wait on an update to Android 7.0 Nougat and EMUI 5 to benefit from system-wide multi-window support. But by the same token you also get Huawei's weird icon setup — yep, despite Huawei phones moving away from obnoxious custom icons for third-party apps, the company's tablets continue to give Google and other applications an irritating rectangular trim that you can't disable. Another of our pet hates is back too: Huawei's iOS-like notification system makes an unwelcome return, as do its many compatibility issues with numerous Android messaging and music apps. It's no easier to excuse these issues on a tablet than it is on a phone. We've already seen that the customized notification shade is going away in the next version of Huawei's software. Until then it's just a case of toughing it out. Overall, the Huawei MediaPad M3 is a decent tablet that reflects where Huawei is right now as a gadget maker: the hardware's still excellent, but it lands at a time where we're waiting on a really big, important update to Huawei's software. There's no guarantee when exactly EMUI 5 (and Android 7.0) will land for the tablet, but like each and every one of Huawei's phones, this device will be immeasurably better once it does. Until that time, it's a cautious recommendation for Huawei's latest Android slate. It's not cheap, with pricing starting at €349 for the cheapest 32GB Wi-Fi model — and that makes it a tough sell over Apple's iPad mini 4. Still, it's a decent option for anyone after a solid, high-end Android tablet without a huge gaming focus. But as ever, Huawei's software quirks are something you'll have put up with — at least in the short term. The Huawei MediaPad M3 will be available in the first wave of launch countries from Sept. 26. This includes China, Malaysia, Saudi Arabia, France, New Zealand, Spain, Germany, Philippines, Thailand, Italy, Portugal, United Kingdom, Japan and Russia.